FOCA wants lake associations to thrive! Our Member Associations have special access to resources and information that is tailored to help Ontario lake and road associations. 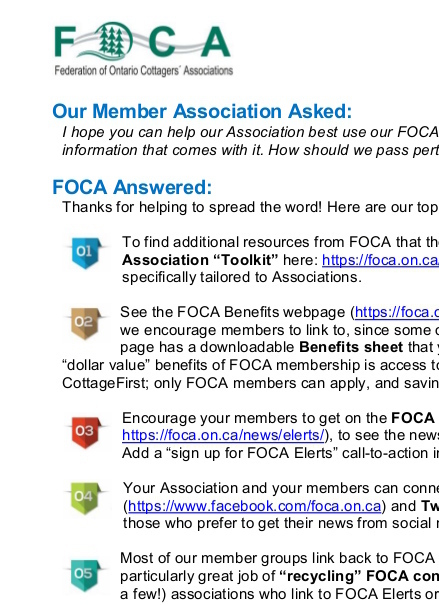 You Asked: “How can we best use FOCA resources and show the value of our membership in FOCA?” Click to download FOCA’s answer (PDF, 1 page), including links to our top tips! NEW! FOCA’s “Lake Association Welcome Binder” is a full template your Association can personalize and circulate to new members and/or visitors to the lake. This amazing resource is adapted from a member Association’s own document, now available for you to customize, as part of your FOCA membership. Chapters include: what the Association does; water quality considerations; fish and boating best practices; emergency info; garbage and recycling; rental responsibilities, and more! Looking for info on a particular topic? 1) Visit the Resources page and type a word (or words) into the “SEARCH” box to find all FOCA information posted on that topic. 2) Still can’t find what you’re looking for? Contact the FOCA office. Get additional resources for nonprofit organizations, here: http://nonprofitlaw.cleo.on.ca/current-law/top-nonprofit-law-resources/ with information about holding meetings, taking minutes, incorporating, and more.